On the National Register of Historic Places, the 1888 territorial one-room school features original furnishings, childhood memorabilia and historic photographs. The Orcas Island Historical Museum in Eastsound is in six old log homestead cabins. Visitors can learn about the native people who lived on the island and early European settlers. No trip to Orcas is complete without a visit to Moran State Park, so head southeast on Orcas Road. Nearly 5,000 acres, Moran is the fourth largest state park in Washington. Shipbuilder Robert Moran, whose estate is now Rosario Resort at Cascade Bay, owned thousands of acres on the island and donated much of it to the state for the park. 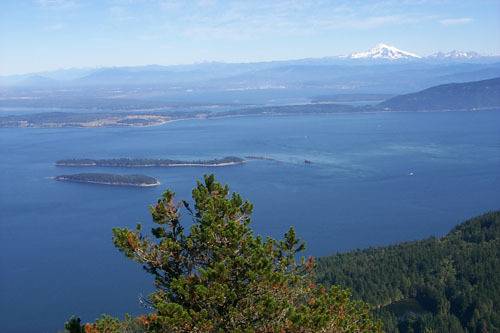 Moran contains 30 miles of hiking and mountain biking trails, Civilian Conservation Corps-constructed picnic shelters, 150 campsites and bridges, hike-in lakes, waterfalls and spectacular views, the best of which is from the top of 2,407-foot Mount Constitution. It's a six-mile drive to the summit and a short climb to the top of the stone CCC watchtower for a 360-degree view of the San Juan Archipelago. If it's clear enough, Mount Baker and Mount Rainier will be spectacular. After coming down the mountain, it's on to Obtruction Pass State Park -- the only great public access to a saltwater beach on Orcas. To find the trailhead to the park, catch Obstruction Pass Road off Point Lawrence Road, then look for the road veering south. There are 11 hike-in camp sites. Back on Point Lawrence Road, head northeast to Doe Bay. The general store is on the National Register of Historic Buildings, and the Doe Bay Village Resort and Retreat with mineral baths is located here.